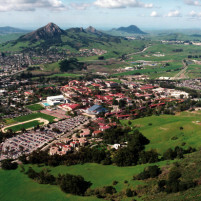 On Monday, the SLO Solidarity sent a list of 41 demands to Cal Poly administrators. Group organizer Matt Klepfer received a death threat on Tuesday, Klepfer said. University police are investigating the threat and searching for the person who sent it. Both police and Dean of Students Jean DeCoasta have been in contact with Klepfer. In response to the death threat, about 100 members of SLO Solidarity demonstrated on campus Wednesday. The group plans to march again on Thursday at 11 a.m. The march will begin at the Kennedy Library. Sudent Colleen Mayone said it is time that minorities on campus stood up and did something and that it is easy for privileged people on campus to ignore the issue. How do we know that this isn’t fake, just like the phoney bomb threats kids did in the late ’60s to get out of taking the mid-terms? Are they including dummies too or is there a 3.6 gpa minimum? There must always be a problem. For why would you enjoy what you have? The grass is always greener..